When people used to ask what we raised out there in the God forgotten land of Thunder Butte, I used to answer that we mostly raised rattlesnakes. That was probably closer to the truth than I realized when I made the comment. Many of my earliest childhood memories are of snakes. They—the rattlers—were everywhere, but on the Butte they were legend. When I was a little boy, about four or five, living on Thunder Butte Creek, we had one under one of the beds one time. We—my mother and a brother or two—had a terrible time trying to get him out. We finally got a noose around him with a forked stick and pulled him out. Another time when I was little, I was sitting on a bank overlooking the creek and just soaking in the view of trees and creek. Birds were singing everywhere and a lonesome coyote trotted through the trees on the other side of the stream. Suddenly, I felt a vibration and looked down just in time to see the tail end of a rattlesnake going into a hole in the bank between my legs. Probably the greatest scare I ever had was when I was about ten years old. I had to take a bathroom break, slid off my horse, and was in the process of relieving myself when I discovered a huge rattler right in front of me. I looked behind me to see if it was safe to step back and discovered the ground was covered with rattlers all around me, in every direction. I never have been able to recall exactly how I got on the horse, but in my memories it seems like I went straight up in the air and came down in the saddle with the horse already on a dead run. When he finally stopped, the horse was quivering with fright. Apparently, we had stopped in the vicinity of a rattlesnake den. There may have been thousands of them in the immediate area. I didn’t just suffer from snakes in the daytime. At night I used to dream about them, too. I would wake up screaming, dreaming that rattlers were crawling all over me. My screaming and fear were so realistic that family members used to come in and check out the bedding and under the bed before I would believe the snakes were all gone. Once, we had an old three-legged dog that was bitten. He just disappeared one day and didn’t show up again for about a week. He had buried himself in the mud of the creek bed. Apparently the mud drew the poison out of the bite. A funny incident occurred when I was about four years old. I had been playing in the water of Thunder Butte Creek and my mother called me to come and have lunch. I started running for the house when I stepped on a large garter snake that was full of baby snakes. I was running and couldn’t stop. When I stepped right in the middle of this old snake, babies shot out of her in every direction. They were so small they looked like worms, but were very active, slithering about everywhere. Much later, when we lived right at the foot of Thunder Butte, I had numerous close encounters with the rattlers. Thunder Butte was well known for rattlesnake activity. My brothers, Joe and Neal, never seemed to fear them as I did. Of course, as I remember, they feared neither man nor beast at any time in their lives. When riding along with one or both of them, we came across rattlers frequently. Joe and Neal always responded the same way. They would step off their horse, jump on the snake with their cowboy boots, pick him up by the tail, swing him fast around their head and snap him as one would with a whip. The rattlesnakes head would explode like the end of a "blacksnake" whip. Another time I was hitch-hiking back to school in Mitchell when I was picked up by a state Parole Agent. After awhile, he stopped the car, walked over to the side of the rode, jumped on a rattlesnake, picked it up, and snapped its head off—just as I had seen my brothers do many times. Apparently, it was an old cowboy custom. 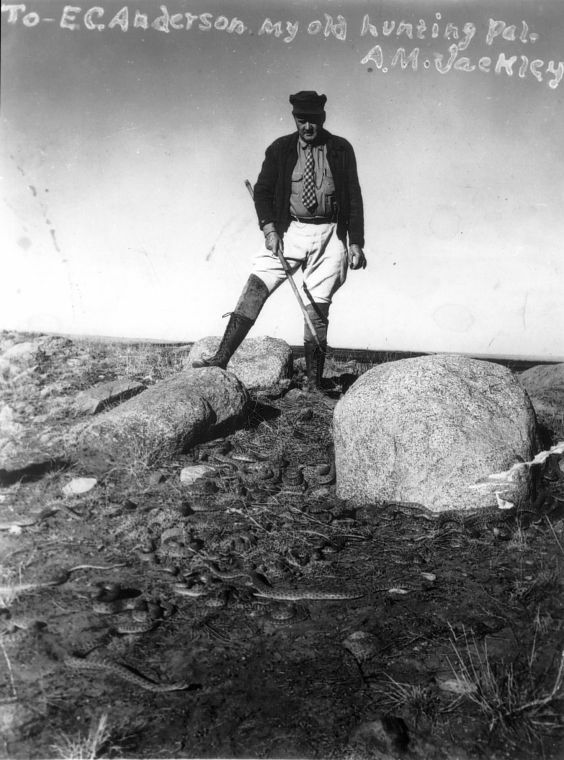 The State of South Dakota hired a Rattlesnake Hunter in the 1930`s and early 1940`s by the name of A. M. Jackley. He stopped by our place several times that I remember, and had a bite to eat with us. I remember him well because he had cages on the back of his pick-up and those cages were full of the maddest rattlers I ever saw or heard. Jackley used to like to collect them on the Butte because he could fill up his truck with little effort. We used to hear people dynamiting snake dens on the Butte. People used to say it was Jackley, but I’m not sure who was doing it. There were huge pits on the Butte, thirty to fifty feet across and as many feet deep. In the fall the snakes would travel for miles from all around the Butte. They would collect in these snake pits and hibernate for the winter. I have seen those pits crawling with thousands of snakes, intertwined in a seething mass. I have heard that in the spring, if the first warm days got them all going at once in the pits they would come out in such mass numbers that they would form into huge balls of snakes and start rolling down the butte. My parents moved to my uncle Joe Shockley's old place not far from the butte sometime after I started college in Mitchell. I have no idea why they moved there. The rattlesnakes were so bad under the house that my mother would heat buckets of boiling water and pour them through holes and cracks in the floor to stop the rattling. Once, she started down the steps into the cellar when a rattler suddenly struck at her between the cellar steps. It missed her and went sailing into the cellar below. I am sure that I have forgotten more than half of the rattlesnake incidents of my youth, but you should sleep better at night knowing that you don’t have to check under your bed for rattlers before going to sleep.